You'll be £6.00 closer to your next £10.00 credit when you purchase The Great War Illustrated - The Home Front. What's this? 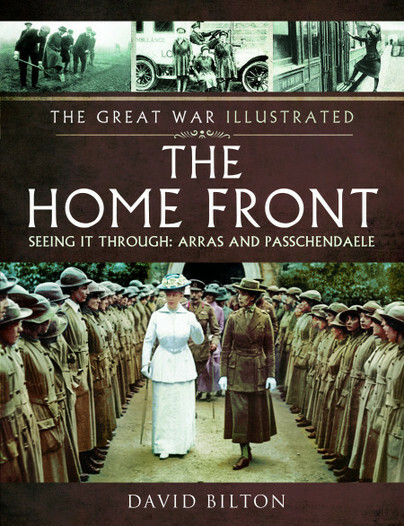 In the 4th volume of the series The Home Front, the author looks at the main events that happened at home in Britain and in other countries, Allied or enemy as well as the neutral nations during 1917. The text provides an overview of the year and sets out to show the effects of war on the civilian population, how it impacted on their daily lives and how they coped with it. Each book is international in scope and draws parallels between the warring nations in their experiences. As in the previous books the focus is on images in order to best understand how they represented themselves and how their world was portrayed to them and with little censorship - bomb damage was freely shown even though it was obvious that the Germans would get hold of the images. With the text are over 200 photographs and illustrations that are divided into discrete sections of the civilian experience of the war. Readers will be familiar with but a few of the illustartaions as most have not been used since they were taken in 1917. For those on the Home Front, 1917 was a year when Total War started to become an actuality. The U-boat campaign meant that food did not get through resulting in shortages. As a result, more land was worked and people started an allotment. With army's demands for men and material seemingly never ending, there were even fewer men about. The majority of those still working were involved in some form of war work and during the year they were joined by thousands more women keen to do their bit. Women replaced men in many traditional male roles. It was a new world. 1917 was a year of belt-tightening, increasing hard work and strain. It would once again, not be over by Christmas, no matter how much they wished. It's a fascinating book and series.